The New Zealand Chess Federation (NZCF) has a new Constitution published and effective from March 2019. New Supplementary Regulations that lead on from the Constitution have also been published. To spare everyone affected from the intricacies of every clause in these documents, we have got our legal team to do an independent review and summarise their findings in plain practical terms when it comes to participation in chess events. These new documents have largely accomplished the main aim of simplifying regulations for everyone involved with playing chess competitively. After all, the main aim is to remove needless bureaucratic work that creates barriers to promoting and playing chess. Here are three highlights we found that greatly simplify and remove barriers to playing chess competitively. 1. Eliminate Annual Player Registration. Most important practical improvement for every New Zealand chess player is removal of the requirement to be registered for the year and pay the fee. Cost to be registered annually and constant ongoing tracking of registered players by officials had been the biggest impediment towards playing chess competitively. With the elimination of player registrations, nobody needs to be affected by this pointless and needless system. Effect of this towards individuals is that NZCF now no longer has direct transactions with individual persons. People now only deal directly with NZCF's member chess clubs without any parallel direct dealings with NZCF itself. Previously there were two parallel but separate dealings, eg. becoming a member of a chess club and registering with NZCF. Now there is only becoming a member of a chess club. Chess clubs now just set their own conditions for people to become members. There are no more pass through charges like annual player registration fees that are collected on behalf of NZCF. A person would now just pay the chess club's membership fees without any additional NZCF charges since the chess club is no longer NZCF's collecting agent. 2. Boost Chess Clubs' Membership. All chess players need to do to be eligible to play in more than one chess competition rated by NZCF per year is to become a member of an affiliated or associated NZCF member chess club. A welcome incentive to help boost membership for every chess club in New Zealand. NZCF's membership fees system is now radically different but greatly simplified, very unlike the previous system where clubs have a fixed NZCF affiliate or associate membership fee and then need to constantly check that every person who wants to join the chess club has paid their annual NZCF player registration fee. Now there is just a simple NZCF affiliate or associate membership fee that is calculated at $10 per member of the chess club. Now NZCF's Constitution recognises that the same person can join multiple chess clubs that results in all affiliated member chess clubs that a person joined increasing their voting power at NZCF general meetings. This makes a NZCF affiliated member chess club's voting power proportionally based on the club's membership numbers without any alteration. It seems that the only class of NZCF members that lose out are people who are NZCF Life Members. The only practical advantage of being a NZCF Life Member is not needing to become a member of any NZCF member chess club in order to play in more than one chess competition rated by NZCF per year. Each NZCF member chess club now independently decides on how to treat everyone who wants to join it since NZCF member chess clubs are no longer NZCF collecting agents. NZCF Life Members are now treated according to New Zealand society's egalitarian ethos where titles and honours do not confer any practical advantages. Chess clubs and officials who organise chess events now find their responsibilities imposed by NZCF reduced. The removal of the means and need to track whether players have met all NZCF conditions to play in chess competitions rated by NZCF means that chess clubs and officials have no NZCF enforcement work responsibility. This eliminates the cause of many disputes and negative reactions faced by officials who organise chess events. Now all chess clubs and officials only need to be responsible for NZCF charges that are incurred by each individual chess event. NZCF charges for one event are no longer connected to other events. For example, there is no need to check if a player has paid annual registration fees at another chess event. NZCF has effectively made all charges contained within each individual chess event. Chess event officials now practically only need to ensure players have paid entry fees before allowing them to play in a chess event. Through not having any direct financial dealings with chess players individually, NZCF has removed all the complications and extra work caused by pass through charges. Next edition of Bay of Plenty Rapid, New Zealand's first and longest running Fischer time control Rapid is already organised on an easy to remember date, 29th February 2020 (leap year day). A remit had been submitted on 30th October 2018 by North Shore Chess Club to be voted on at the 2019 NZCF Annual General Meeting. This remit would reduce NZCF annual player registration fees from the current $20 to just a nominal $1. A very positive initiative by North Shore Chess Club to remove another unnecessary "tax" by NZCF. Keeping a single list of registered players nationwide online costs NZCF practically nothing. In terms of time, the automated player registration system was stress tested by the NZCF Secretary in 2013 and handled a 5 million player register in less than an hour. Number of players registered can easily increase 10 fold from the current less than 500 and it would take less than a minute a month to maintain the register. Having a registered players list available online listing all registered players nationwide is of immense benefit to NZCF. Every chess player should be encouraged to be registered by making registration practically free. Just like it costs nothing to be registered in the electoral roll, there should not be a "poll tax" to be listed as a registered NZ chess player. We encourage NZCF affiliated member clubs to vote in favour of this remit by North Shore Chess Club at the NZCF AGM. Two remits had been submitted on 26th October 2018 by Mount Maunganui RSA Chess Club to be voted on at the 2019 NZCF Annual General Meeting. 1st remit is to remove $10 levy per team that participates in Interschool Regional Qualifying competitions. This levy was meant to be used to fund travel grants for teams to participate with free entry into the National Interschool Finals. Since travel grants are no longer provided and entry fees are now being charged for National Interschool Finals, this levy just serves as a revenue grab by NZCF. 2nd remit is to make NZCF Council meeting minutes published online. NZCF Council meeting minutes used to be published online to enable downloading by NZCF members to freely distribute to everyone. All decisions by NZCF Council must be made at a council meeting and the proof of which are the meeting minutes kept by the NZCF Secretary. Meeting minutes need to be published so that everyone affected by NZCF Council decisions would know about the decisions and that they were validly made. Since NZCF is a registered charity without any commercial or sensitive activity, there is no reason for secrecy and instead every effort should be made for transparency and accountability as a standard practice of openness. We encourage NZCF affiliated member clubs to vote in favour of these remits by Mount Maunganui RSA Chess Club at the NZCF AGM. It is with great regret that we announce the passing of Dato' Tan Chin Nam, long time benefactor and honorary Life President of Malaysian Chess. Those of us in NZ who took part in the Malaysian Open over the years will remember his enthusiasm for the event and the players - he even took part in the Seniors section when it was introduced. His contribution to development of chess in Asia was immense. October 20th-22nd 2018 - Merv Morrison Memorial, Auckland. September 23rd - October 6th 2018 - 43rd World Chess Olympiad, Batumi, GEORGIA. CM Helmut Marko of Mount Maunganui RSA Chess Club plays for Papua New Guinea. Congratulations to Vyanla Punsalan for earning WFM title! 1st: CM Alphaeus Ang, on 24.5/27. Winning both Blitz (8.5/9) and Rapid (8/9). 2nd: FM Ben Hague, on 22/27. 3rd: Evan Capel (MAS), on 20/27. 1st: Daniel Runcan, on 17.5/27. 2nd: CM John Duneas, on 17/27. 1st: Philli Park-Tamati, on 15.5/27. 2nd=: Luis Angel Duran Rubalcava (MEX), on 15/27. 2nd=: Allen Li, on 15/27. 1st: Boyuan Zhang, on 13/27. 2nd=: Matthew Chen, on 12/27. 2nd=: Ian Lewis, on 12/27. August 25th-26th 2018 - Peter Stuart Memorial (North Shore Open), Auckland. This event commemorates Peter Stuart. Link to official website by North Shore Chess Club. Follow on Vega from the NSCC website: Open, B-Grade, C-Grade. 1st=: Evan Capel (MAS), FM Mike Steadman, on 4.5/5. 3rd: FM Ben Hague, on 4/5. Flukey 1.c4 upset prize: Winston Weng, in round5 draw. 1st=: Antonio Krstev, CM Benjamin Lim, on 3.5/5. 1st=: CM Alex Nagorski, Juni Aguilar, Philip Hair, CM Richard Meng, Xinyang Liu, on 2.5/5. 1st=: Erwin Koestanto, Brett Rider, on 4.5/5. 3rd: Euan McDougall, on 4/5. 1st=: Nigel Cooper, Felix Xie, on 3.5/5. 1st: Phili Park-Tamati, on 3.5/5. 1st=: Ravi Lakshmi, Edward Ashworth, on 4.5/5. 3rd: Jay Zi Xuan Zhao, on 4/5. 1st: Ying Wang, on 3.5/5. 1st: Kevin Shen Su, on 3/5. 1st: Thomas Zheng, on 3.5/5. 1st: Pasindu Jayawickrama, on 3.5/5. 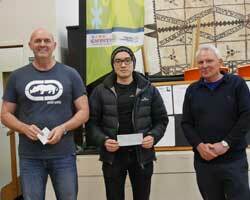 L-R: FM Mike Steadman, Evan Capel, Open 1st= with Michael Whaley presenting prizes. 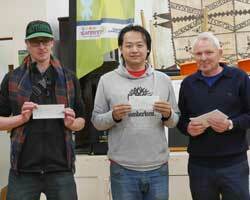 L-R: Brett Rider, Erwin Koestanto, B-Grade 1st= with Michael Whaley presenting prizes. August 1st 2018 - Rating Milestone Accomplished! The monthly FIDE rating list, published today, was awaited with considerably more anticipation than usual in New Zealand. Happily, it confirmed that our calculations were correct, and that his round 5 victory in the Waikato Open put FM Ben Hague over the magic figure of 2400 (a requirement for the IM title). July 27th-29th 2018 - Waikato Chess Open, Hamilton. 2nd=: FM Mike Steadman, IM Russell Dive, on 4.5/6. Waikato Champion: NM Graeme Spain, on 4/6. 1st: Nathan Goodhue, on 4/6. 2nd=: FM Bob Gibbons, CM Hilton Bennett, on 3.5/6. 1st: Luis Angel Duran Rubalcava, on 3.5/6. 2nd=: Josia Vickers, Juni Aguilar, on 3/6. 1st & Waikato Junior Champion: Michael Lin, on 5.5/6. 2nd=: Lara Heppenstall, Bill Crombie, on 4.5/6. 1st: Kendrick Zhang, on 4/6. 2nd=: Gary Judkins, Jeffrey Yu, Ying Wang, on 3.5/6. 1st: Joel Crombie, on 3/6. 2nd=: Tracy Liu, Vraj Dhankee, on 2.5/6. L-R: Nathan Goodhue, Luis Rubalcava, NM Graeme Spain, IM Russell Dive, FM Ben Hague, CM Hilton Bennett. July 18th 2018 - Dvorkovich meets Asian Chess Federations, Tashkent, UZBEKISTAN. FIDE presidential candidate Arkady Dvorkovich had a meeting with representatives from 14 Asian chess federations. Uzbekistan Chess Federation's hospitality was appreciated by the federations that attended (Afghanistan, Bangladesh, Jordan, South Korea, Laos, Mongolia, Myanmar, Nepal, Palestine, Tajikistan, Thailand, Turkmenistan, Vietnam). Good ideas were put forward for the future of chess. These would be productively used by the campaign ticket. Full results on Vega: Masters; Qualifiers; Reserves; Talents. FM Ben Hague, champion with IM norm. July 12th 2018 - North Shore Chess Club's skilled volunteer. The FIDE Presidential Board meeting has confirmed that Tingling (Lynn) Wei has achieved the norms for the FA arbiter title - this will be awarded once the 60-day period for registration has completed, in a few weeks. Lynn is a Committee member at the North Shore Chess Club, where her services as liaison with the Chinese-speaking chess community are highly valued. She also serves as Treasurer on the executive council of the Auckland Chess Association, putting her accounting qualifications to good use. Here Lynn is shown checking out the new computer that North Shore CC purchased with a Pub Charity grant. She will be using it to run club events with Vega - and as an arbiter at the Peter Stuart Memorial weekender in August (www.northshorechess.org.nz/northshoreopen.html). Skilled volunteers such as Lynn keep chess running in New Zealand and we thank them all! FA Lynn Wei checking out new computer purchased by North Shore CC with a Pub Charity grant. Venue: Lyell Creek lounge, Alexandra Park. From 9.30am. Organised by Auckland Chess Association. A very closely contested event ended in victory for the North Shore A team, aided by North Shore B (in third) who held up the opposition! The Auckland Red team finished second. Photos and articles on our Facebook page (no login required): NZ Chess News. 1st: North Shore A (CM Richard Meng, Andrew Li, Matthew Chen, Nina Nguyen). 2nd: Auckland Red (CM Allen Fan, Winston Weng, Felix Xie, Isabelle Ning). on 7/10 Match Points, 14/20 Game Points. 3rd: North Shore B (Thomas Zheng, Allen Li, Kendrick Zhang, Jeffrey Yu). on 7/10 Match Points, 12.5/20 Game Points. 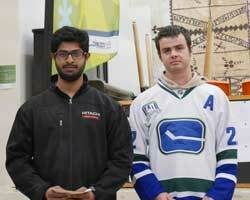 4th: Papatoetoe A (Hugh Gao, PYS Jayawickrama, Ansh Gupta, Max Jiang). on 7/10 Match Points, 12/20 Game Points. Follow on Orion: Junior Interclubs. Matthew Chen, CM Richard Meng, Andrew Li, Nina Nguyen. Follow the event on Vega: A-Grade; B-Grade; C-Grade; Junior. L-R: Linda Cooper, John Francis, IM Anthony Ker, Bob Smith. More under this event's entry in Results webpage. Wake up to this view at the venue! John Liu, Under 12 Open. Tracy Jiajie Liu, Under 10 Open. Isabelle Yixuan Ning, Under 10 Girls. 2nd= FM Nic Croad, WIM Layla Timergazi, FM Mike Steadman, IM Russell Dive. Full results on Vega: A-Grade , B-Grade , C-Grade , D-Grade . Full results on Vega: A-Grade; B-Grade; Junior. The funeral for Peter Stuart will be held at 11am on Monday 19th February at Forrest Funeral Services, Glen Road, Browns Bay. The MillenniumHotels.com New Zealand Open finished with the visting French GMs in 1st and 2nd places, but the more important local fight for the title of 125th New Zealand Champion was decided by a last-round battle. Alphaeus Ang won quickly, reaching 6/9, and was able to watch most of his challengers fall behind - Mike Steadman and Bob Smith lost to the Frenchmen, and Allen Fan was held to a draw by Australian GM Darryl Johansen. That left a fascinating game with Daniel Gong (on 5½) trying to hold off the challenge of Russell Dive (on 5). Dive eventually won, and shared the title with Ang. Alphaeus is only 15 - the same age as GM Murray Chandler, back in the 1975/76 event, where Chandler scored his first Championship. A sign of great things to come? We can certainly hope so! In any case, it is clear that Youth is finally making a breakthrough against Experience in New Zealand! Full details can be found in the dedicated NZ Congress 2018 webpage. Download the Minutes here (pdf document). To summarise, we lost the election to the other ticket. The policies that we promoted that were expressed through remits from North Shore Chess Club and Mount Maunganui RSA Chess Club were also lost, although voting for the Mount Maunganui remit and the first North Shore remit (on registration fees) were tied and defeated by chairman Murray Chandler's casting vote. Mt Maunganui Remit, to require open tender process before NZCF can contract out events. Murray Chandler cast the chairman's vote to defeat the remit. North Shore Remit1, to cut NZCF annual player registration fees to $10. North Shore Remit2, to make NZCF tournament levies inclusive of FIDE rating fees. North Shore Remit3, to revert interschools levies back to $5 per team. No extra charge to teams for playing in national finals. These were the delegates casting the clubs' votes at the AGM. 5 votes, Auckland, Mike Steadman. 2 votes, Canterbury, Edward Rains. 2 votes, Hamilton, Murray Chandler. 1 vote, Hawkes Bay, Bernard Carpinter. 2 votes, Howick-Pakuranga, Stan Yee & Tony Booth. 1 vote, Mt Maunganui, Helen Milligan. 3 votes, North Shore, Helen Milligan. 2 votes, Otago, Leighton Nicholls. 1 vote, Papatoetoe, Helen Milligan. 2 votes, Upper Hutt, Anton Reid. 1 vote, Waitakere, Bob Smith. 4 votes, Wellington, Ross Jackson & Russell Dive. It is with great sadness that we have learned of the death of our friend and colleague Peter Stuart. We offer our condolences to all his family and friends. Further details will be posted here on our website when we have them. I'd like to write a few lines about Peter. I moved to New Zealand in 2007 so I have not known him as long as most of you have. However, during that time, he became a good friend and a trusted advisor. He was a man of complete integrity and the highest principles, dedicated to chess and particularly to juniors and club players. He was a stickler for correct procedures and cost-effective organisation. His enthusiasm and constant hard work kept our club active and involved in every aspect of Auckland chess - ACA Interclubs, NZCF Interschools, Jenkins Trophy matches, internal tournaments in a variety of categories, time controls, and even chess variants (Fischer Random for example), and of course our annual North Shore Open, which he organised and directed. We have been honoured to have him on our ticket. His input to our policies was substantial and he shared our vision for junior development and organisational upgrade. In particular, we were encouraged by his confidence in our ability to put our policies into practice. He will be sorely missed by our team and by North Shore Chess Club - but we will continue to present our ideas for the future of NZ chess, knowing that he will be cheering us on. At the NZCF AGM in January 2018, there will be an election to choose between two nominations for Council. It is the first time an election has been held for nearly 20 years. Usually, Council changes by means of a gradual process as people retire or take a break from duties. So usually, there is no need for chess clubs and chess players to get seriously involved or consider different approaches. This time it is different. There are two clearly different approaches on offer. We would like you to consider our agenda. Volunteers are capable people who freely contribute their time, talent, and effort for NZCF to be well run. Of course, it would be good if we could have a full-time paid administrator, taking care of every organisational detail and answering all queries. Over the past few years we have indeed had someone who was effectively full-time, though paid at a part-time level. The net result has been that she has worked many hours to collect money which has not been sufficient to pay a living wage for the person doing the collecting. Our conclusion is that this does not work and is not improving the state of NZ chess. The people who make up the chess community in New Zealand are chess amateurs for whom chess is not a source of income, and they do not generate (cannot generate!) sufficient funds for us to treat chess as a professional sport and fund administration accordingly. Chess in New Zealand is an activity that many parents consider useful for their kids, alongside physical sports, music, and of course schoolwork. In later years schoolwork, exams, and university entrance become overwhelmingly important. We therefore have a large and constant supply of young schoolchildren, who are not likely to be treating chess as a potential career or even a main hobby. This is the population we need to cater for, and it is the population from which we should be seeking support, as the parents are understandably anxious to give their kids good opportunities to improve and win titles and awards! Reducing annual player registration fees by 50% (from $20 to $10). Including FIDE rating charges as part of tournament levies. Reversing interschool levies from the recent increase back to $5 per school team. We believe these would all be very popular measures. Currently anyone who plays chess outside the major centres (Auckland and Wellington) is likely to complain about having to pay the $20 registration fee for only a couple of events per year! FIDE ratings are popular and with a monthly update they provide a certain 'instant gratification' which is mandatory in today's fast-moving world. Interschool levies are a burden to those trying to run school events in areas of low income. Many tasks performed by chess organisers involve a lot of repetitive work. A major project to alleviate the burden through automating most work that is currently done manually is a priority. For example, it would be possible to set up a system where tournaments were advertised online, with online entry fee payment and registration, leading to automatic updates of Vega files, with further integration into the NZCF ratings database and Grand Prix points calculation. This is not something that would happen overnight - but we have computer experts on our ticket who could work on this project, not to mention considerable computer expertise in the general population of chess players! One of our mottos might be to ensure that every child in an Interschools event is capable of mating with queen or two rooks against bare king - and perhaps also capable of avoiding a quick end by Scholar's Mate! If we accept that our main challenge is to promote chess among young schoolchildren, then we must look at providing them with the coaching they need to make the most of their years of chess activity. Not everyone aspires to be a Grandmaster - but in the long run, if we want Grandmasters, then a large pool of well-educated children would be essential. We would like to promote coaches on our official website, and our long-term plans include provision of weekly opportunities for kids to play and have their games analysed by coaches. Maybe, one day, a real National Chess Centre?! Competitive chess includes regional and national Interschools events, weekend events run by clubs and other local organisers, internal rated club events, and the array of official NZCF Championships. We would facilitate all of these, with various targeted initiatives. Recently, organisation of regional Interschools events (where 'regional' includes the events in Auckland areas and in Wellington) has faltered. NZCF has attempted to revive these by giving lucrative contracts to outside organisers (replacing the local clubs, who traditionally ran these events). While this approach may have short-term advantages, in our opinion it needs to be more open, with opportunities for talented organisers to bid for events that local clubs have given up on. Mount Maunganui RSA Chess Club has submitted a remit to the AGM calling for an open and transparent procurement process, and we support this. The mechanics of running events are another area where we would hope to be involved. Chess players are happiest when tournaments run smoothly, according to the schedule, with results promptly posted online. For junior chess players (and their parents), it is important that events are rated, preferably in both the NZCF and FIDE lists. All this is possible (and indeed normal) when events are run by well-trained, competent arbiters using up-to-date pairing software (ie Vega). It is our intention to train local arbiters around the country, to increase the pool of people happy and confident with the use of Vega and implementation of FIDE regulations. We would also train arbiters to use DGT boards for live games. Being an arbiter is perhaps something that not many people would be interested in. Chess also needs people who understand the logistics of running an event - particularly events with large numbers of people, such as Interschools. We would like to harness parent power to help with these events, with the idea that the parents of one junior generation would then pass on the knowledge to parents of younger kids as they come into the chess world. Of course we would also welcome student power - the teenaged organisers of the highly successful NZ Girls' Team Championships have our great respect! Progress in chess means improving, obtaining norms, and obtaining titles. At present this is really only possible if you (or your parents) can fund trips abroad, to play in strong international events where norms are possible or direct titles on offer. There are a few opportunities in NZ: the George Trundle Masters annually offers norm possibilities; the top section at Congress sometimes has norm opportunities; rare events such as the Zonals or the recent Asian Seniors offer direct titles. We would continue to facilitate participation in international junior tournaments abroad (with direct titles). Recent NZCF policy has been to allow anyone to play in these, with selection procedures only if more than one player applies for a place in the same category of an event with free board and lodging for national representatives. Players are assumed to benefit from the experience, even if they are weak relative to others in their age category in NZ, and unlikely to do well in the chosen event. Where we beg to differ from the current administration is in our support for local players in direct title events in New Zealand. We would be much more proactive in bringing Asian continental events to NZ, and when we obtain permission to run such events (which might include Asian Youth, Asian Junior, Asian Seniors, etc) we would make NZ results a priority, with support for our own top players rather than for high-profile foreigners. The members of NZCF, according to our constitution, are the clubs. It is the affiliated clubs that will vote at the AGM. As a member of a club, you have probably voted for your club committee. Your committee will appoint a Delegate with instructions to vote at the AGM. Please, talk to your committee, and make sure they vote on the issues. This is an important moment in NZ chess, with a choice of roads forward.